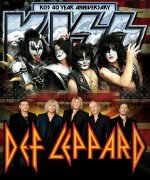 Def Leppard and KISS have today announced their 2014 Summer Tour of the USA and Canada which will kick off on 23rd June. They will play 42 shows starting on day 23rd June 2014 in West Valley City/Salt Lake City, UT. KISS will close each night with each band playing for 90 minutes. The tour runs through until 31st August 2014 in Houston/Woodlands, TX. Seven shows will be played indoors in arenas. Notable shows include a return to the LA Forum (unplayed since December 1992) and Alpine Valley Music Theatre in Wisconsin (unplayed since July 1993). The much rumoured tour was announced earlier at a press conference in Los Angeles at the House Of Blues before an audience of 200 invited military veterans and service members. The event was streamed live on Live Nation's website. Tickets will go on sale from Friday. One dollar from every ticket will be donated to veterans. This is the first major US tour since the 2012 Rock Of Ages run with Poison/Lita Ford. Also the first time since 2005 that the band has played a co-headline tour and gone on before another artist. They performed 12 of the 25 ballpark shows that year before Bryan Adams when they flip-flopped headline duties. Joe Elliott - "We're not jam bands either of us," Elliott said in an interview from Dublin. "It's very theatrical what Kiss does to a lesser extent obviously 'cause we don't do the makeup thing, our show runs like a military operation for sure. It's not like the Grateful Dead and Phish touring or something." The legendary bands will embark on a U.S. tour June 23 in West Valley City, Utah. They will play more than 40 dates, including Los Angeles; Austin, Texas; Nashville, Tenn.; Atlanta; and Tampa, Fla. The tour wraps Aug. 31 in Woodlands, Texas. "You have two bands who to one degree or another have stood the test of time and put them together and you'll have a great night of music," said Paul Stanley of Kiss in an interview. "We're living in a time now where everyone wants more for their money, and that's understandable. So, when you can get two bands to collaborate together, we couldn't pick a better band for this tour than Def Leppard to go out with us." "The "2014 Heroes Tour" will help change the lives of veterans and military families across America. That's why KISS and Def Leppard are teaming up with the U.S. Chamber of Commerce Foundation's Hiring our Heroes program to make this special announcement in front of an exclusive audience of the men and women who have proudly served our country."